Weight of Unseen (2011) is an interactive kinetic sculpture. 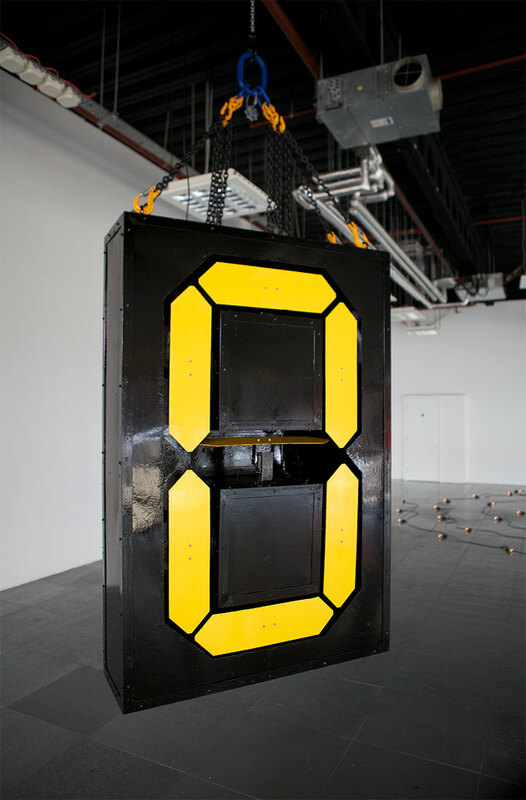 It’s built with a large seven- segment display unit made out of steel, seven motors, a manual chain hoist, a length of chain and a proximity sensor that measures its vertical position from the floor. 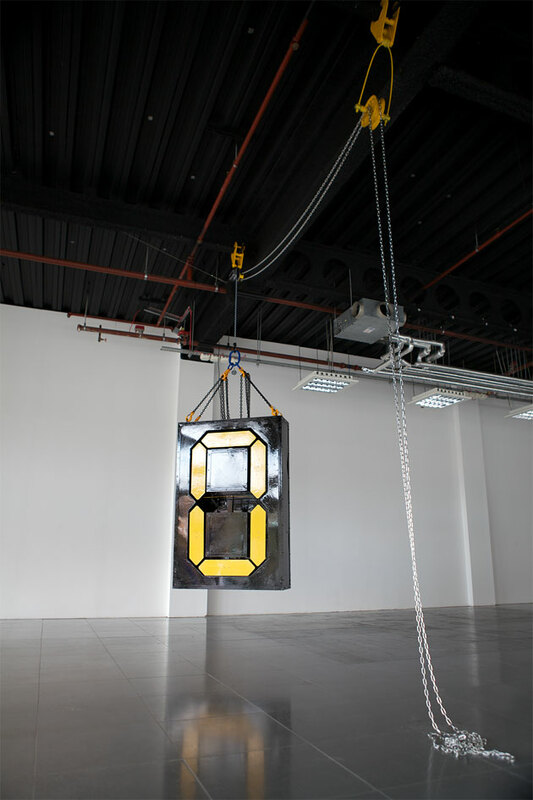 Audiences can interact with the sculpture by pulling the chain from the hoist, then the display changes depending on its vertical position. It only displays 0 and 1 in a combination, which is a binary code 00011010, meaning end-of-file. Weight of Unseen is a result of Ronin’s investigation of contemporary lifestyle. The dependency on unseen systems, which lie in all forms of media and media control, is becoming predominant. In this context, the artist poses questions about where the sincerity is, as opposed to indiscriminate behav- iour from the addiction of communication in the ever most accessible world. Ronin Cho’s interest lies in between two different spaces: the material/physical world and the immaterial/electrical world. The value of the immaterial is rapidly increasing as technology, Internet and small gadgets are popularised. Accordingly, the dependency on unseen systems and their influence is escalating followed by an alteration of people’s belief and behaviour. The artist himself is a model of a person who has such a dependency on unseen system. However, since he found himself struggling finding where the sincerity is, he despises this unseen system for its illusion and side effects such as its speed of change, which disrupts digestion of thoughts. Then he started to crave certainty in the material/physical world as well as balance between two worlds in this inseparable disparity. The fantasy of pressing a button is already realised and part of our life; we don’t need to understand how the system works. However, lack of awareness in the behaviour leaves unwanted or unintended marks. And because of the behaviour alteration, the level of consciousness reaches near to the ground. From these changes, Ronin explores the origins of this phenomenon by finding unnoticed parts of everyday electronic appliances. In his work, the various characters of those objects and their non-physical status are transformed into something sturdy, physical and tangible. And the way the audience interacts with the work requires much more physical power than is usual. By elevating their physical presence to a sense- sharpening tool, he tries to provoke a question to the audience: where is our belief in this hurried shifting time?